In this post, I shall look at three examples; firstly, Mrs Churchill, the rich aunt by marriage of Frank Churchill in Emma. She brought him up after his mother’s death and dotes on him but that hasn’t stopped her from exercising strict control over his life. She is generous to him; he obviously has plenty of spending money but it comes at her discretion, and she is a capricious woman. He is supposed to be her heir – he changed his name from Weston to Churchill on his coming of age – but it is not official. Interestingly, Mrs Churchill is entirely off stage; we never meet her but her influence is profound. Mr Knightley ends by saying, ‘It is Frank Churchill’s duty to pay this attention to his father (visiting him on his marriage). He knows it to be so by all his promises and messages; it he wished to do it, it might be done.’ Frank’s omission is discourteous towards the new Mrs Weston, in particular. He wrote her ‘a very handsome letter’ but the actual visit keeps getting put off. 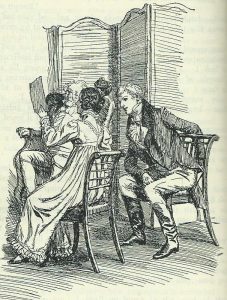 The reader gathers that Mrs Churchill is jealous of Frank’s relationship with his father. Even so, there may be something else behind Frank’s procrastination. 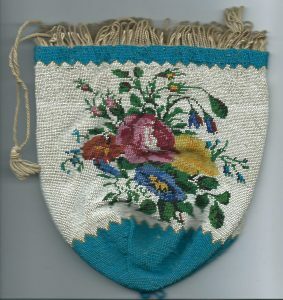 Frank has a secret, one which could have serious repercussions if his aunt gets to hear of it; he is secretly engaged to Jane Fairfax, whom he met in Weymouth. Jane is acknowledged by all to be beautiful, talented and cultured. Unfortunately, she has no money and Mrs Churchill’s jealous nature could lead her to disinherit Frank. 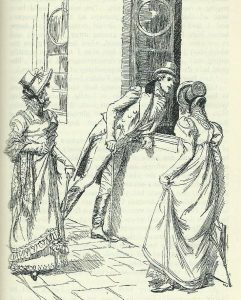 The reader realizes, much later, that Frank only appears in Highbury when Jane Fairfax returns to her aunt and grandmother who live there. 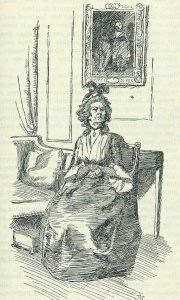 My second wealthy female relation is Mrs Smith, the elderly cousin of Willoughby in Sense and Sensibility. Willoughby is her presumed heir but this, as with Frank Churchill, is unofficial and could be revoked. Willoughby at least has some money of his own, what Sir John Barton calls ‘A very pretty estate’ in Somerset, worth about £600 p.a. It’s not a lot for a gentleman but, if he chose to live modestly, he and Marianne could manage. To complicate matters, Willoughby has been living beyond his means and is in debt. He visits Mrs Smith at Allenham every year, just to keep her sweet, and he does his best to keep secret his unsavoury seduction of the sixteen-year-old Eliza, the ward of Mrs Smith’s neighbour, Colonel Brandon. Mrs Smith, like Mrs Churchill, is off stage and we never meet her. 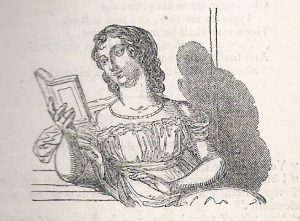 Willoughby’s seduction of Eliza and her having had his child, has made Willoughby’s personal situation far more perilous than Frank’s. When Mrs Smith discovers it, she demands that he marries Eliza. Willoughby refuses and what follows is a total breach. That night, before he leaves Allenham, Willoughby wrestles with his conscience and decides that, much though he loves Marianne, it is ‘insufficient to outweigh the dread of poverty, or get the better of those false ideas of the necessity of riches.’ He abandons Marianne without any real explanation, causing her a great deal of distress, and goes to London to find a rich wife. Ironically, once he is married, Mrs Smith relents. She approves of his marriage to a ‘woman of character’, and reinstates him as her heir. He gets what he thought he wanted – money, but loses what he has come to realize is far more valuable, marriage to a woman he loves. My third rich older woman is the widow, Mrs Ferrars, the mother of the hero, Edward Ferrars, in Sense and Sensibility. Edward, as her elder son, is the heir but he is not financially independent. He has £2,000 of his own which brings in a mere £100 p.a., not a sum a gentleman can live on. Edward, too, must dance to his mother’s tune. 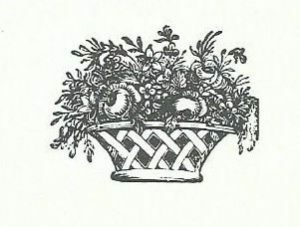 Mrs Ferrars appears two thirds of the way through the book when Elinor and Marianne visit their half-brother in London. Elinor and Marianne pay a call on him, together with Lucy and Nancy Steele. This is the only time we see Mrs Ferrars for ourselves. 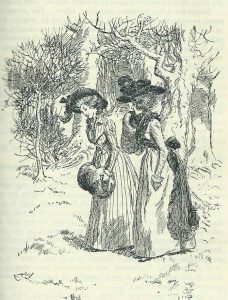 She is a little, thin woman with ‘a strong character of pride and ill nature’ She suspects that Edward loves Elinor and ‘eyes her with the spirited determination of disliking her at all events’, addressing not a single word to her. Instead, she pays a lot of flattering attention to Lucy Steele who has been secretly engaged to Edward for four years. The reader knows that sooner or later Lucy’s engagement to Edward will come out. What will Mrs Ferrars do? 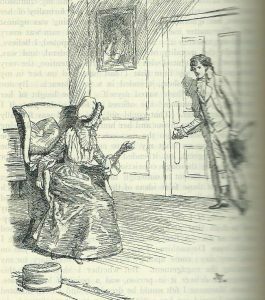 For the rest of the book, she’s off stage, but Jane Austen allows Lucy several scenes triumphing over Elinor (Lucy suspects an attachment between Edward and Elinor). We also hear from Lucy’s cousin, Mrs Jennings, that Mrs Ferrars has cut Edward off without a penny; and from an appalled John Dashwood, Elinor’s half-brother, who can’t understand why Edward won’t marry the rich Miss Morton; and from Lucy’s vulgar sister, Nancy. The eaction of each illuminates the respective characters. Edward does as a gentleman ought; he stands by his engagement to Lucy, though he has long since ceased to love her. Now almost penniless, he moves into cheap lodgings. His only option is to take Holy Orders (which he wants) but, without the help of a rich patron, he’ll be lucky to find a curacy, which, notoriously, paid a pittance; £50 p.a. was not unusual. 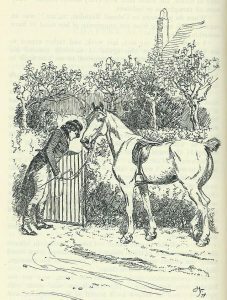 Colonel Brandon steps in and generously offers him a living. It is only worth £200 a year but it means that Edward is no longer homeless and has a future. Robert, his asinine brother, now officially Mrs Ferrars’ heir and with the income that should have been Edward’s, elopes with the artful Lucy. Mrs Ferrars becomes reconciled with Edward, accepts his marriage to Elinor, and gives him £10,000, the sum she gave her daughter Fanny on her marriage to John Dashwood. 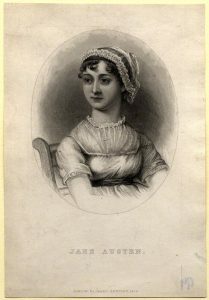 I find it interesting that Jane Austen has three rich, older women who pull strings to control younger male relations. Mrs Churchill and Mrs Ferrars are both seriously manipulative and unpleasant. Ultimately, Mrs Churchill’s death removes the obstacle to Frank’s marriage with Jane. Mrs Ferrars has to give way and allow Edward a decent sum of money, even if it is only half of what he should have had. Both women’s behaviour ratchets up the dramatic tension, and tests the young men’s mettle, which is something every author should be looking to do. Mrs Smith isn’t overly intrusive; she doesn’t have a prospective bride waiting in the wings, for example. She thinks as a right-thinking woman should. Willoughby complains about ‘the purity of her life, the formality of her notions, her ignorance of the world,’ and tries to dismiss her outlook as old-fashioned, but his speech only serves to show up his selfish disregard for Eliza, Marianne and Mrs Smith herself. Out of the three young men, Willoughby is the one who really loses out. I discussed this post with my Mediaeval historian brother who said that anyone from a similar background in the 14th century would have understood the problem instantly. It was the norm until comparatively recently that the older generation controlled the family money. He reminded me that marriage settlements ensured that a widow had her dowry, but she was also legally entitled to ‘the widow’s third.’ That could tie up an awful lot of money. Just read Emma again so found this interesting. 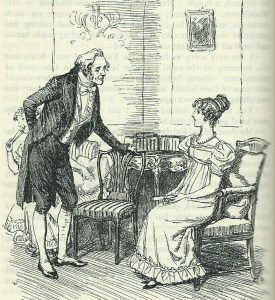 I was struck by the clever way Austen manages to engage sympathy bit by bit for Emma as she realises her own shortcomings and matures from spoiled vanity to sense and modesty but without losing her liveliness and charm. Skilful writing. Add your observations and my esteem increases. I agree, Elizabeth. I was re-reading the bit where Emma meets Frank with Mrs Weston and Emma notices the skill with which he winds Mrs Weston round his little finger. He’s perfectly sincere but, all the same, he knows how to give her exactly the right impression. I’d noticed this before too, and wondered if there was an older controlling female somewhere in JA’s own history! I’ve never heard of “the widow’s third” – was it still the default in the early 19th century? The widow’s third still applies if, for example, the husband dies without making a will. Re: the controlling female in Jane Austen’s own past, I thought that, too. However, as my Mediaeval historian brother said in my final paragraph, a 14th century person from that sort of background, would have recognized the problem immediately. The older generation holding the family money at the expense of the younger generation was the norm. If, for example, you are widowed young and are left with a number of children to bring up, and your eldest son, who has inherited the estate is a spendthrift, you’d be hugely relieved that you have the widow’s third by law – and your dowry. You’ll need it. Sounds like you’re working toward writing a new novel! I would certainly welcome that. Thank you, Steve. That’s very kind of you. I am busy with other things at the moment but I hope to get back to writing fiction one day. If, or when I do, I shall certainly announce it on my website!